Superhero Sayings: No one tries to hard to make the world better. 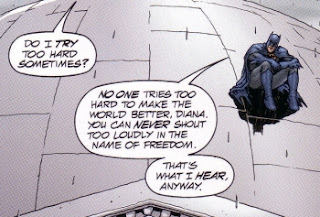 This uncharacteristically optimistic quote from Batman follows the Justice League's jaunt into the Earth-2 universe where they faced off against the Crime Syndicate. This is a fine bit of storytelling from Grant Morrison and I highly recommend this graphic novel if you're a fan of either his or Frank Quitely's work! Superb story which seems to have been the inspiration for the recent Justice League: Crisis on Two Earths DVD. When's the last time you were upset for trying too hard? Probably when you failed at something right? No? That's right, because we always think we didn't try hard enough! I think one only ever feels that we're trying too hard when we keep trying over and over again and nothing comes of it but it's important to remember that success only comes to those who keep trying their best! References: Taken from JLA: Earth 2 (ISBN: 1-56389-631-1) by Grant Morrison (writer) and Frank Quitely (artist). Excellent quote choice. I agree with your point. Honestly, how many times have you tried way too hard at the things that you love to do and seem to end up right where you least hope? We spend too much time talking and less time speaking, but even far less time listening and observing. I appreciate the work you are doing here. Check out my blog when you get the chance. Thanks! When I originally started this blog I never realised how few good sayings there are in any given graphic novel or comicbook! It's mostly biff, bang, crash and arbitrary discussion about taking down the villain. I've read about what you're trying to achieve by using superheroes in your teaching methods and I think that it's an inspired idea!